Today was the VegMel Vegan Pot-Luck Picnic, to which I was invited by the lovely Steph from VeganAboutTown (who made some of my recipes! How cool is it when people actually make your recipes? And change them? And then you get to taste them? Very cool, that’s how cool it is…). And I got to meet Cindy from Where’s the Beef (who had been bemused at the number of seemingly-unrelated people on Friday tweeting about eating raw tacos at the cricket), and hang out with Hailey from Ballroom Blintz, which was wonderful. I am, in fact, quite serious about this being the same as yesterday’s recipe – if you swap out the coconut milk for almond milk and the cocoa for ground pistachios, if you keep the raspberries whole and use rosewater and cardamom as your flavours rather than raspberry essence, and if you then swap out the wheat flour for a mix of gluten-free flours, this is what you get. And it’s really, really good – moist and sweetly-scented and raspberryish and not too rosy. But beware the fairy-floss! My finished cupcakes looked like I had decorated them with muppet scalps, and ten minutes after that, the muppets began melting until my cakes looked a little sadly hairy. Pistachio fairy floss may be an excellent source of inspiration, but as a cake decoration, I fear it is only for those who can make use of the last possible minute (and are better at making fairy floss look good on cakes than I am). What follows is actually not the method I used – it’s the method I should have used and would have used if I had been thinking clearly rather than making things up and adding stuff a bit randomly as I went along. So you have my absolute permission to dump things into the mixing bowl in pretty much any order you like, though do keep the baking powder and bicarb until last, or they will do all their chemical magic before you can get them in the oven. So. Start by pre-heating the oven to 175°C, and lining two 12-cup muffin trays with paper cases. Pour the almond milk into a large bowl and add the vinegar. Let stand for a few minutes while you move on to the next step. In a food processor, blitz the pistachios with the cardamom and a tablespoon of the sugar (or, if you have any of that wonderful pistachio and cardamom sugar from Gewürzhaus, just use a tablespoon of that and omit the cardamom) until finely ground. Add in all the different flours and starches and the baking powder and bicarb, and blitz again briefly to combine everything and make the pistachios even finer. Now add the sugar, sunflower oil, rosewater and vanilla to the almond milk and mix well. Tip all the dry ingredients out of the food processor into the bowl, and mix thoroughly – the mixture will have strangely hard lumps at first – starch will do that when it hits liquid – but will turn into a nice, thick, greenish batter surprisingly fast. Fold in the raspberries with a spatula, and divide the mixture between your baking cups. Bake in the oven for about 20-25 minutes, until they are well-risen and springy and the house smells amazing. This is when you will discover that something in the cakes has had an impressive anthocyanin reaction, and your cupcakes now have blue patches. Quite a nice blue, for a change – usually anthocyanins make things a really ugly colour, but it seems the pistachios are your friend. Pretend you meant to do this all along. Blue food is cool. Let the cakes cool on a rack before icing with extremely pink icing. For the icing, dump your icing sugar into a bowl and add the orange flower water and raspberry juice (which is to say, press your raspberries through a sieve until you think you have a couple of tablespoons of juice). I tend to feel that sifting is for other people, but feel free to sift if that floats your boat. Squeeze in enough lemon juice to get a paste which is really quite alarmingly pink and thick enough that when you lift out a spoonful and put it on a cake, it mostly stays put and only spreads very slowly. Is this icing pink enough for you? Put about a teaspoon of icing on each cake, and swirl it around a bit, then decorate with a whole pistachio, a silver cachou (which may not be vegan and gluten-free, actually, so if this is something that matters to you, do check), or fairy floss, if you have no objections to eating melty muppet scalps. They really were yummy, though. The cakes, not the muppets. We’re already vegan and gluten-free here, but I don’t think nut-free is on the cards without totally changing the flavour of these cakes (which is, after all, baklava with raspberries – it even manages to taste honeyed, and I have no idea how I achieved that). Similarly, I don’t think low-GI-ness is on the cards, even with the allegedly low-GI raw caster sugar and raw icing sugar possibilities out there. For one thing, I seriously doubt that even the lowest-GI icing sugar is going to be very low-GI once made into a whole lot of icing, and even without the icing, it’s a fairly sweet cake. And speaking of low-GI icing sugar, do beware of this if you are avoiding gluten, because the starch they use in it is from wheat – I realised this as I was just about to make the icing, and had to make a last minute run to the shops for the regular icing sugar mixture (which uses the higher-GI but gluten-free corn-starch). You might manage low-fructose by omitting the raspberries, but this does seem like a bit of a shame. I’m actually fairly enamoured of this recipe as it stands, I’m afraid! If you are not aiming for gluten-free and are intimidated by all those flours and starches, I’d suggest taking out everything from the rice flour to the xanthum gum and using 2 1/4 cups of plain flour instead. In terms of flavours, didn’t I do this yesterday? Oh, but I’ve just had a thought about making these as sort of middle-eastern upside-down apricot cakes – mix a tablespoon or two of brown sugar with a little cardamom, and divide this mixture between your muffin cases, then top with half an apricot, cut side down, in each case. For the cake itself, omit the raspberries and replace the rosewater with orange flower water (perhaps using a little less, as I always feel it’s a stronger flavour). Gorgeous. I’m going to have to make that recipe now, aren’t I? I’m so glad you came along so that we could meet you! Thanks for sharing around such lovely cupcakes too. It was great to meet you, too! And congrats on the radio interview (haven’t had a chance to listen to it yet, but very cool that you were on there)! Heavens, this flavour is perfect for my soul. Bravo! Thank you! This was definitely one of my better inspirations! It was so lovely to meet you, Catherine! I very much enjoyed nattering to you all afternoon. Also these cupcakes have been haunting my dreams, so I’m tremendously relieved to now have a recipe so I don’t end up going mad through longing for raspberries and fairy floss in cupcake form. The feeling was very much mutual! It was absolutely lovely to meet you and to chat, and I’m so glad you like my cupcakes! 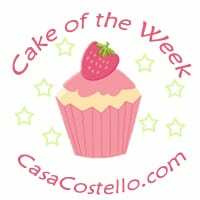 Thanks so much for entering Cake of the Week – I love the look of those cakes – even more now they have a muppet reference! One resolution for this year is definitely to try some more gluten free baking. Good luck with the gluten-free baking! I haven’t done all that much yet, but I’m slowly building up knowledge in that arena… increasing numbers of friends with gluten- or fructose-intolerance will do that!